Aaron is right about America’s reserve currency status, and also there is the petrodollar in addition to the ‘flight to safety’ and other factors that are keeping interest rates low and the dollar high, all thanks to American exceptionalism. As bad as the US economy may seem, other countries are worse, although I am more optimistic about America’s economic prospects than many on the ‘alt right’. Economically, America is like the smartest kid in special ed. I’ve discussed the debt situation earlier here and here. It’s not as bad as it may seem. However, the treasury prints money, not the fed. QE is not the same as debt monetization. 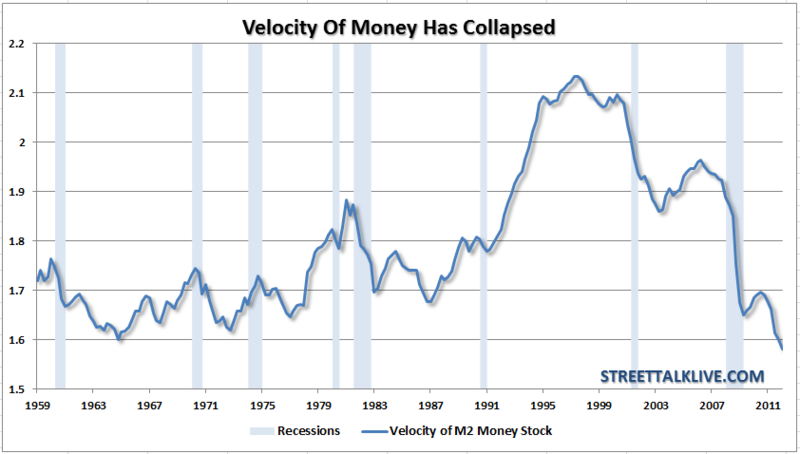 This is distinction explains why the money supply has not increased in spite of QE. The story here couldn’t be more self explanatory. 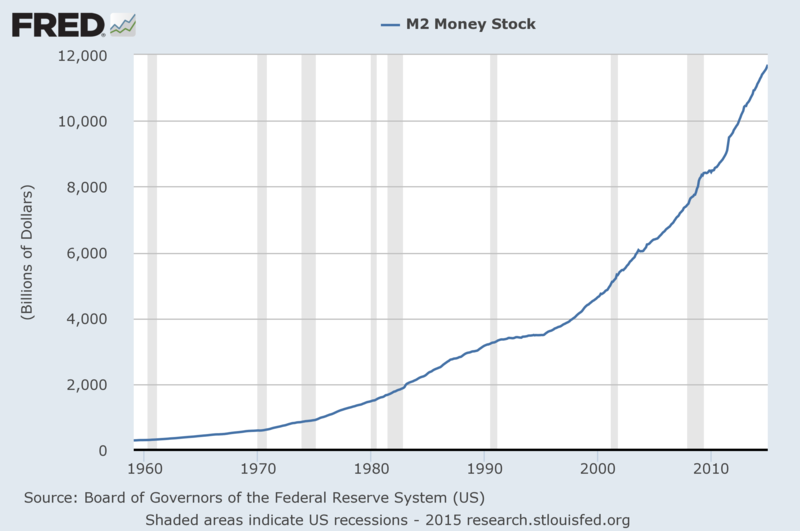 The US M2 money supply is simply not expanding anywhere close to its historical rate. Loan activity is stagnant. Monetary policy can be likened to taking a bunch of money, sticking it in a safe, and melting the key. Monetary policy seems to be more psychological (as a way to boost confidence) than to alter the structure of the economy itself. The reasoning is simple – the money multiplier is a myth. So, it doesn’t matter how many apples (reserves) the Fed puts on the shelves. It doesn’t result in more apple sales (loans). Banks are never reserve constrained. The explosion in reserves and continuing decline in loans makes this crystal clear. 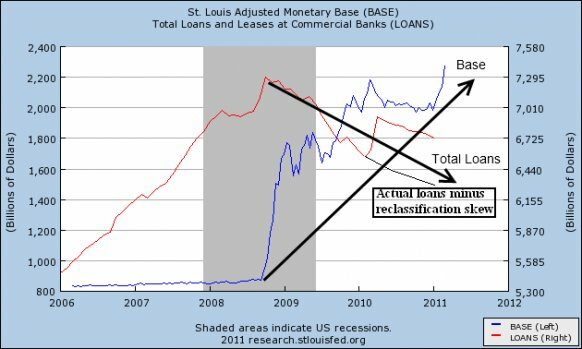 The Fed can continue to stuff banks with reserves and unless we see a substantive increase in lending the expansion of the monetary base will continue to be insignificant. QE is just another tool in the fed’s toolbox to lower interest rates on the longer-duration of the yield curve after conventional monetary policy has been tried. For all the dire warnings over China’s retreat from U.S. government debt, there’s one simple fact that is being overlooked: American demand is as robust as ever. 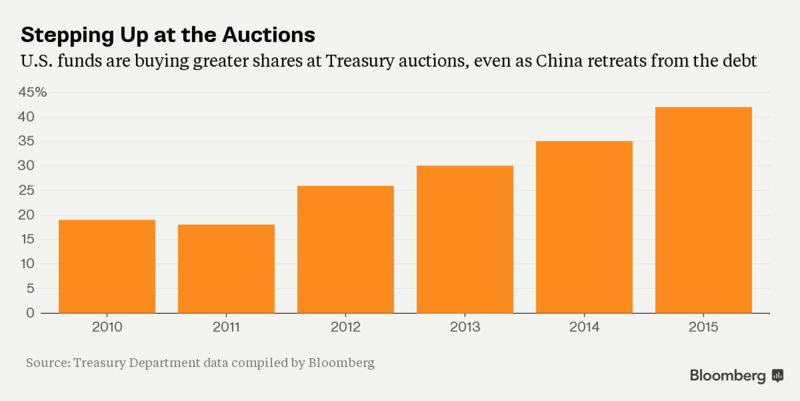 Not only are domestic mutual funds buying record amounts of Treasuries at auctions this year, U.S. investors are also increasing their share of the $12.9 trillion market for the first time since 2012, data compiled by Bloomberg show. American funds have purchased 42 percent of the $1.6 trillion of notes and bonds sold at auctions this year, the highest since the Treasury department began breaking out the data five years ago. As recently as 2011, they bought as little as 18 percent. 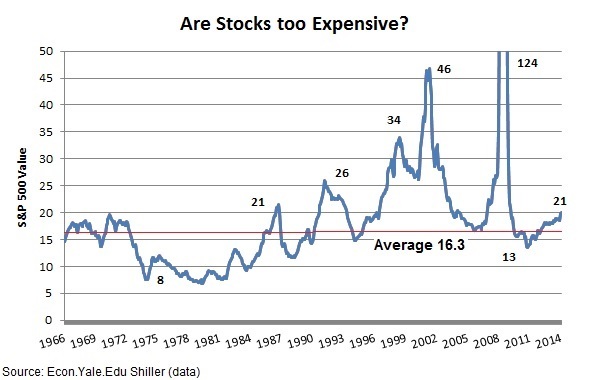 There is so much demand for low yielding, safe US debt that the bigger concern is deflation, not inflation. 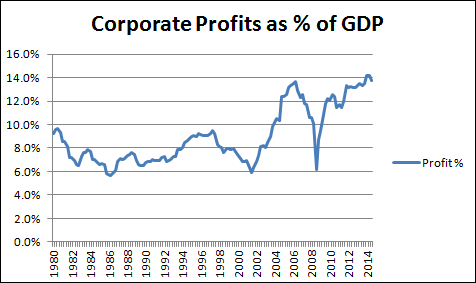 Aaron mentions the stock market going up a lot since 2009, and this is true, but this has more to do with strong economic fundamentals (profits & earnings, globalization, consumer spending, technology, rich people consuming, etc) than QE or money printing. Just look at multinational companies like Google, Amazon, Apple, Disney, Microsoft, and Nike, all of which keep posting strong earnings quarter after quarter. The new Star Wars movie set a box office record and is expected to gross over $2 billion globally. People are buying stuff, and businesses are transacting with other businesses. The S&P 500 is up 25%, and the QQQ tech index up 40%, since 2013 when the fed announced they were going to end QE. 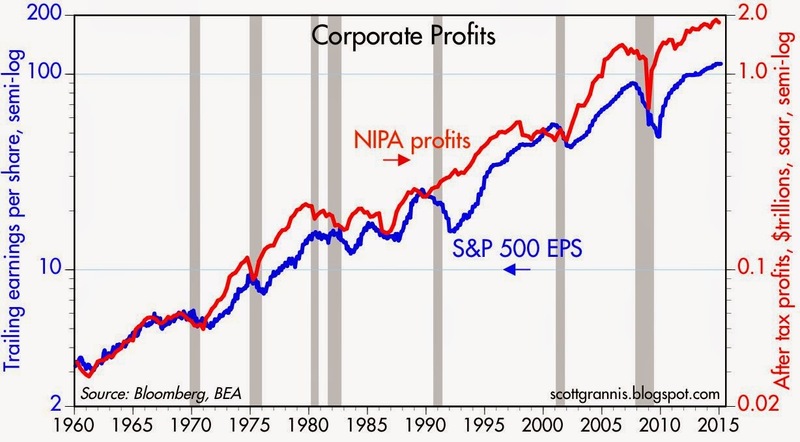 That is evidence economic fundamentals, not the fed, are driving this economic and stock marker expansion. Also, too add, foreign countries don’t want to dump their US dollar holdings, because they are devaluing their currencies to boost growth, as part of the global ‘race to the bottom’, which America is the beneficiary in the form of a strong dollar and low inflation. However, as I have argued numerous times before, America’ reserve currency status is not an invitation for reckless spending. As I’ve written about in the past, with the exception of certain bright spots in the US tech sector and retail, the entire global economy is lethargic, creating a flight to safety and thus low rates, especially for American, Germany, and Japan. 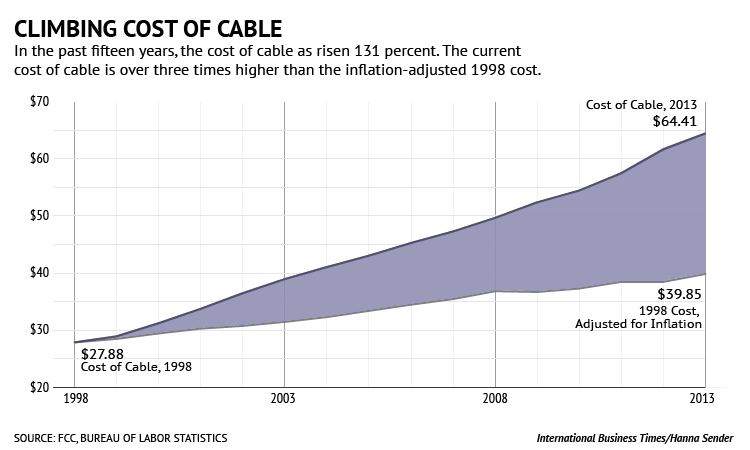 Also, deflationary forces from falling commodity prices. Deflation is a bigger concern than hyperinflation.